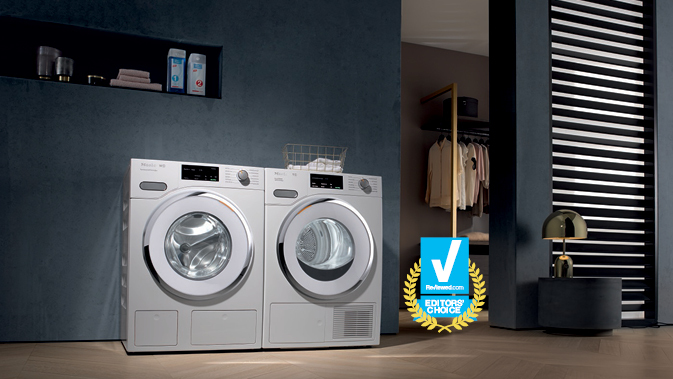 Princeton, NJ – Miele, the largest family-owned luxury appliance manufacturer, is proud to announce that the new W1 washing machine has received the Reviewed.com Editors’ Choice Award in the compact washer category. This recognition follows a thorough product test conducted by Reviewed.com’s appliance analysts. With three W1 washing machine models available, the award winning WWH860 incudes TwinDos, CapDos and QuickIntenseWash, which optimizes the precision and process for washing. The TwinDos feature automatically dispenses proprietary detergent and oxygenated bleach to each load of laundry. This mode eliminates the possibility adding to much or too little detergent, which can result in a poor wash or damaging the lifespan of the fabric. CapDos is one-time use detergent pod for specific clothes such as wool, sportswear or outerwear. These pods along with the matching machine program allow the user to wash items that require specific care instructions. With QuickIntenseWash, Miele achieves a high-level cleaning performance in a surprisingly short time. This washing mode provides excellent cleanliness in less than 60 minutes. The Reviewed.com Editors’ Choice Award was developed as a process to provide its readers with the answer of what the consumer should purchase. With detailed testing and comparison reviews, the Miele W1 WWH860 ranks highest among similar products in its category. Visit the Miele W1 and T1 laundry site for complete detail on the product along with videos highlighting some of the newest technologies. Or visit the Dealer Finder page to locate your nearest authorized appliance retailer. Reviewed.com's product experts use lab testing to rate and review the latest consumer electronics and home appliances, helping guide consumers purchases. Reviewed.com editors select the best performing and best value products for the company's Editors' Choice and Best of Year Award programs. Founded in 1998, the company was acquired by USA TODAY in January 2011 and powers technology coverage in USA TODAY and Gannett media properties. Reviewed.com and the USA TODAY Network reaches more than 140 million monthly U.S. uniques.